Anyways part of my March Favorites is this baby pictured above. 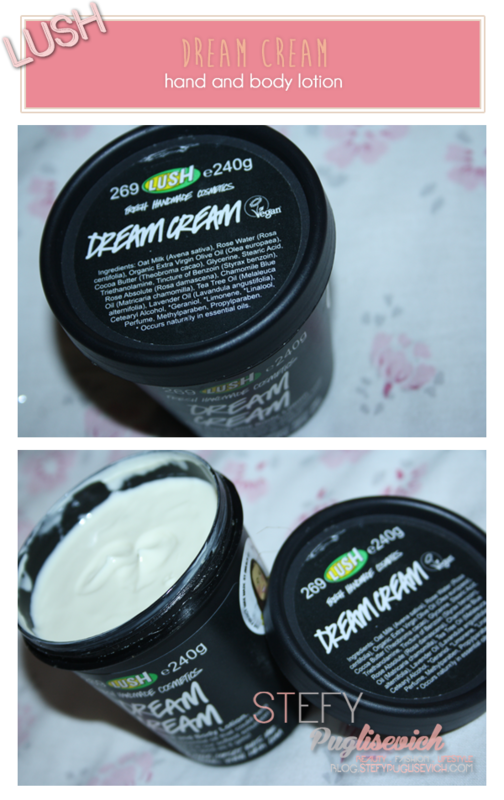 I Support LUSH 100%, It's a brand that will fight against animal cruelty and bring out products that smell divine. HAVE YOU SMELT SNOW FAIRY???? I should slap myself for getting off topic haha! Back to this gorgeous black tube of joy, DREAM CREAM. I fell for this box of yumminess after having a shower and wanted a full on #pickmeup #session. The smell lingers after you get out of the shower too. What I remember the lady in the LUSH shop on Regent street telling me that this is their number one body lotion product that customers regularly repurchase. In my case I totally agree. It is for all skin types as it leaves the skin feeling so soft. I do sometimes end up with little red bumps on my legs, particularly after shaving them and this lotion actually helps soothes them. I do not think it is over-priced as it will go on for more than 4 months depending how heavy handed you are. DO YOU USE A BODY LOTION AFTER A SHOWER? I love LUSH! have you tried the cosmetics? I saw them in Amsterdam in Dec. but I didn't manage to go back and buy!! I wish the brand was still in Malta I always stock up on bath bombs when abroad. My bf is addicted to the brand more than me! Ha! When we went to Sicily he noticed LUSH like I noticed H&M.... Love Love LOVE.